Britain-based monitor says air strikes by US-led coalition kill 43 people in ISIS holdout in eastern Syria. 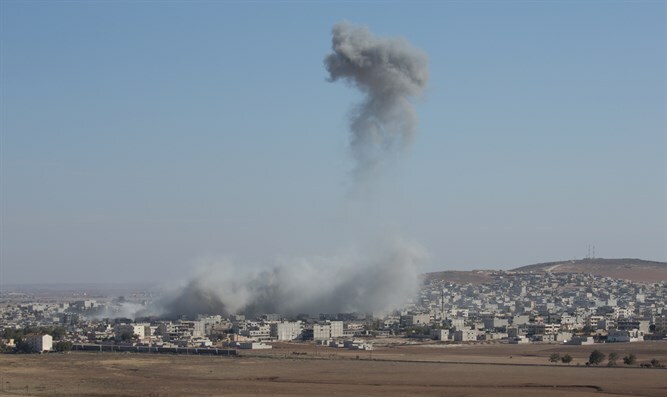 Air strikes by the US-led coalition against the Islamic State (ISIS) on Saturday killed 43 people, mostly civilians, in a holdout of ISIS in eastern Syria, a Britain-based monitor said, according to AFP. 17 children were among 36 ISIS family members killed in the Abu Husn village of the Deir Ezzor province near the Iraqi border, the Syrian Observatory for Human Rights said. Another seven victims had not yet been identified as either civilians or ISIS fighters, said the monitor. The US-led coalition has been backing a Kurdish-Arab alliance called the Syrian Democratic Forces (SDF) fighting to expel the jihadists from the pocket around Abu Husn. "It's the highest death toll in coalition air strikes since the SDF launched its attack against the IS pocket" in September, Observatory chief Rami Abdel Rahman said. The coalition has stressed it does its utmost to prevent civilian casualties. "The avoidance of civilian casualties is our highest priority when conducting strikes against legitimate military targets with precision munitions," spokesman Sean Ryan told AFP this week. Since then, several military offensives, including those backed by the US-led coalition, have since seen ISIS lose most areas it once controlled, including the loss of their de facto capital Raqqa in Syria.. The coalition has since 2014 acknowledged direct responsibility for over 1,100 civilian deaths in Syria and Iraq. In September of 2016, the Pentagon apologized after the US-led coalition struck Syrian military positions inside the country. Elsewhere in Syria, Syrian rebels said on Saturday the Syrian army and their allies were intensifying attacks on a demilitarized zone in the northwest in an attempt to undermine a Russian-Turkish deal that has averted a major offensive on their last stronghold, Reuters reported. The rebels said the army has stepped up its onslaught with hundreds of mortar and rocket attacks on a string of rebel-held villages and towns in northern Hama, southern Idlib and Latakia that fall within a demilitarized zone agreed last September between Russia and Turkey. Russia and Turkey reached a deal in Sochi last September to enforce a demilitarized zone in Idlib and adjacent areas that are the last stronghold of rebels who rose against President Bashar Al-Assad in 2011. Under the deal Turkey had pledged to drive out Al-Qaeda-inspired jihadists from the zone, but Russian military is increasingly questioning Ankara's ability to implement it. The main jihadist group, Tahrir Al-Sham, has so far not withdrawn heavy weapons, a regional intelligence source said on Saturday. Tahrir Al-Sham is headed by Abu Mohammed al-Golani, who previously headed Al-Nusra Front, which was the Syrian branch of Al-Qaeda before the two groups cut ties. Al-Nusra was then rebranded to head the Hayat Tahrir al-Sham alliance.